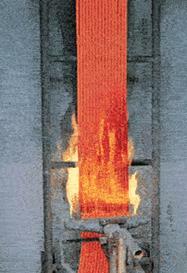 This tese defines the flame propagation characteristics of single vertical insulated wire or cable. The specimen is deemed to have passed this test,if after burning has ceased,the charred or affected postion does not reach within 50mm of the lower edge of the top clamp. This test defines vertical flame propagation characteristics of bunched cables.The test comprises of 3 categories each defined by the amount of combustible material in a 1 metre sample,as shown as below. The cable samples are placed vertically next to one another on a vertical ladder tray where they are exposed to fire from a gas burner for the above mentioned times. The specimen consisting of 3.5m,is deemed to have met the requirements,if after burning has ceased,the extent of charred or affected portion does not reach a height exceeding 2.5m above the bottom edge of the burner. The temperature on the cable is between 750℃ & 800℃.After 3 hours ,the fire and the power is switched off.12hours later,the cable sample is reenergised and must maintain iits circuit integrity. BS 6387 specifies the performance requirements for cables required to maintain circuit integrity under fire conditions It details the following methods to categorize the cables according to cable withstand capacities. Resistance to fire alone –the cables is tested by gas burner flame while passing a current at its rated voltage.Four survival categories are defined :Cat A(3 hours at 650℃);Cat B(3 hours at 750℃); Cat C(3 hours at 950℃)& Cat S(20 minutes at 950℃). Resistance to fire with water spray-A new sample of cable if exposed to flame at 650℃ for 15 minutes while passing a current at its rated voltage and then the spray is turned on to give exposure to both fire and water for a further 15 minutes .A single survival category W is defined if the cables surpasses the testing requirement . 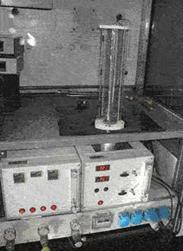 Resistance to fire with mechanical shock –the final requirement is mechanical shock damage.A fresh sample if mounted on a backing panel in a S bend and is exposed to flames while the backing panel is stuck with a steel bar with same diameter as the cable under test every 30 seconds for 15 minutes.The cables will be tested under the following temperatures:X(650℃).Y(750℃)and Z(950℃). This specifies a test for determination of the amount of halogen acid gas,other than the hydrofluoric acid evolved during combustion of compound. When tested in accordance with IEC 60754-1,the hydrochloric acid yield should be less than 0.5% (5mg/g) for LSHF compound. For LSF compound,the hydrochloric acid yield should be between 5% to 15%. 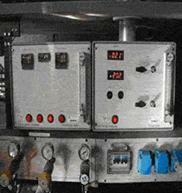 IEC 60754-2 :Determination of Degree of Acidity of Gases. This test specifies a method for determination of acidity of gas evolved during combustion of cables by measuring pH and conductivity .The specimen is deemed to pass this test if the pH value is less than 4.3 when related to 1 litre of water and conductivity is less than 10 us/min. The ″3 metre cube test ″measures the generation of smoke from electric cables during fire. A light beam emitted from a window is projected across the enclosure to a photo cell connected to a recorder at the opposite window .The recorder is adjusted to register from 0% for complete obscuration to 100% luminous transmission. A 1 metre cable sample is placed in the centre of the enclosure and then subjected to fire. The minimum light transmission if recorded. The result is expressed ad percentage of light transmitted. The specimen is deemed to pass this Test (IEC 61034-2) if the value is greater than 60%. A similar test BS 6724 also defines the density of smoke emitted from armoured cables during fire. The amount is expressed as the standard absorbance Ao,Ao value is usually less than 0.8 for a cable with overall diameter of 15mm to 25mm. This test gives a measure of the cable sheath flammability characteristics under a specific set of conditions . Oxygen index is defined as the minimum concentration of oxygen,expressed as volume per cent,in a mixture of oxygen and nitrogen that will just support flaming combustion of the material initially at room temperature under the test condition. This is similar to the oxygen index test. 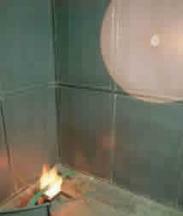 Whereas in the oxygen index test,the oxygen content is varied at room temperature,in the test the oxygen concentration is kept constant at 21% and the test temperature is varied until,again,combustion is just sustained.this test is more complex but gives a more realistic measure of a material’s performance in a real fire.